Wild parrots native to South Asia and North Africa are ubiquitous in today's London, with a feral population according to some accounts reaching scourge levels. 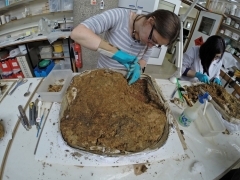 Two millennia ago in Roman London? Not so much. However, there were parrots in Roman London, ancestors of today's British parrots. But those parrots were depictions on exquisite Roman frescos recently discovered buried below the streets of London. 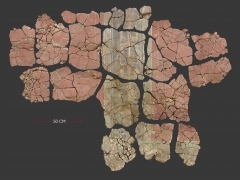 An ornate fresco that once adorned the residence of a wealthy Roman citizen has been discovered by a team of our archaeologists at 21 Lime Street, in London. We uncovered the fresco six metres below street level, whilst undertaking archaeological fieldwork for a new office development. Dating to the late 1st century AD, and the first decades of London, it is one of the earliest surviving frescos from Roman Britain. 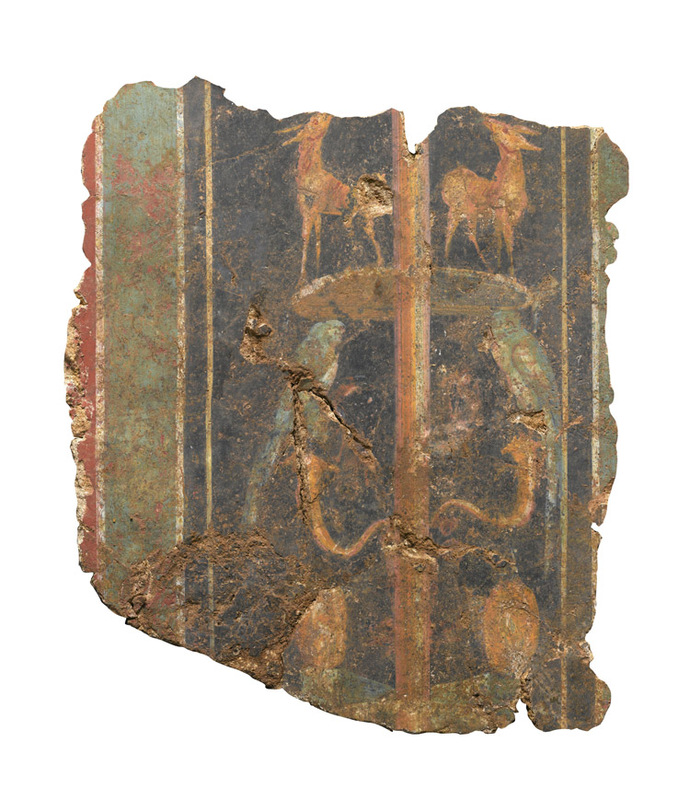 Thanks to a huge Roman construction project, the fate of this rare wall painting was literally sealed in the ground. In AD 100, construction of the 2nd Forum Basilica, the main civic centre for the city and the largest Roman building ever built north of the Alps, began. In advance of construction of the Forum the area was flattened. The painted wall was deliberately toppled and the Forum immediately built over it, incredibly preserving the fresco for nearly 2000 years. Discovered face down, the fresco was identified from the distinctive markings of the keyed daub onto which the plaster was attached. 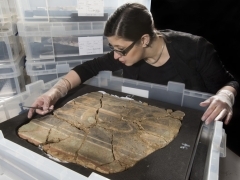 The fragile remains, surviving to a width of nearly 2.5 metres and a height of over 1.5 metres, were carefully removed from the site by our archaeological conservators, who lifted the fresco in 16 sections. Each section was supported, undercut and block lifted so that soil encased and protected the plaster. Back in the lab the conservators worked quickly to micro-excavate the soil whilst it was still damp, to expose the millimetre-thin painted surface beneath. The painting is likely to have decorated a reception room where guests were greeted and entertained. . . The central section, on a background of green and black vertical panels, depicts deer nibbling trees, alongside birds [Indian Ringneck Parrots], fruit and a vine woven around a candelabrum. Red panels, bordered with cream lines, surround the main decorative scheme. The fresco was hand-painted by a skilled artist in natural earth pigments, except one area of red on the twisting vine stem which is picked out in cinnabar, an expensive mercuric sulphide pigment that had to be mined in Spain. It is not inconceivable that some wealthy Roman packed his companion parrot with him on his travel to London. That we may never know. This fresco demonstrates that ancient Romans regarded parrots highly enough to depict them in all their glory even in their most distant outpost of Britain.